A novel that taught me how it feels to be a female trapped in a male’s body. Regan has a secret sister, Luna, who only comes out by the light on the moon. Regan tries to live an ordinary teen life, but this secret she carries weighs her down, and she feels as if she can never be normal. But she loves her brother, Liam, too much to cast him aside. Reading Luna, my heart went out to both Regan and Liam, and I truly understood for the first time what it’s like to be a transgender: it’s hell. Because of their close minded parents, Liam is forced to live a lie. This talented, brilliant young man has closed himself off to the world so much, he’s contemplated suicide. Why do we force people into stereotypes? Why can’t we accept them for who they truly are? Luna is filled with heartache, but it’s also a ray of hope. 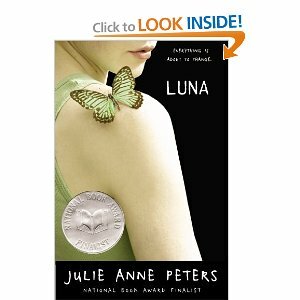 I would have liked to see more about Regan’s budding relationship with her boyfriend, but Luna’s story eclipsed all that. The book ends suddenly leaving you with the feeling that everything is up in the air. It’s a realistic end, and what would be expected of such a deep and truthful novel. Sounds like this one really got you thinking. Great review. Aww! It sounds like a good book. Thanks for the review, Aubrie! I hadn't heard of this one.